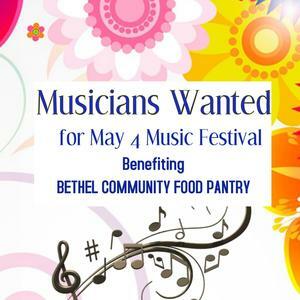 Musicians of all ages -- individuals and groups, singers and instrumentalists -- are invited to perform in a May 4 music festival benefiting the Bethel Community Food Pantry. The festival, titled "A Joyful Sound," will take place in Bethel's historic St. Thomas' Episcopal Church. Sign up for one or two 15-minute performance slots and invite family and friends to hear you. As this is a family event, all songs must be "G-rated." St. Thomas' has a piano, a small electronic keyboard, mic, amp and speakers. ALL proceeds from this event will go to the Pantry. Cash and checks payable to Bethel Community Food Pantry will be collected on event day. This third annual music festival benefiting Bethel Community Food Pantry is dedicated to the memory of the festival's founder, Howard Blayney.